Modern Door Levers for a Clean and Simple Look. Modern door levers are feature a sleek contemporary design along with the latest in finish options including stainless steel, flat black, satin nickel and more. We have over 100 modern lever handles, each with multiple finish and rosette options. From our modern value hardware like the SureLoc levers to the high end Emtek, Omnia, and Linnea levers, we have contemporary levers to fit your style and your budget. Because of their sleek design characteristics most modern lever styles do not accomodate a keyed lock. 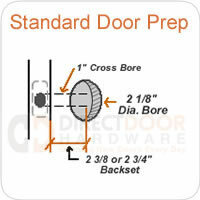 Be sure to check out our matching deadbolts.